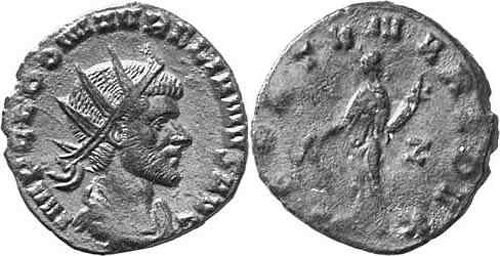 L. Domitius Aurelianus, was born about A.D. 212, at Sirmium, in Pannonia. He entered the army as a common soldier, and his extraordianry bravery was raised to offices of trust and honor by Valerian and Claudius II. On the death of the latter, he was elected Emperor by the legions at Sirmium. Obverse: IMP C AVRELIANVS AVG, Radiate, cuirassed bust right. Reverse: PACATOR ORBIS, Sol, walking left, right hand raised, left holding whip. Mintmark dot A dot L.
Obverse: IMP CL DOM AVRELIANVS AVG, Radiate, draped bust right. Reverse: FORTVNA REDVX, Fortuna standing left, holding rudder and cornucopiae. Obverse: IMP AVRELIANVS AVG, Radiate and cuirassed bust right. 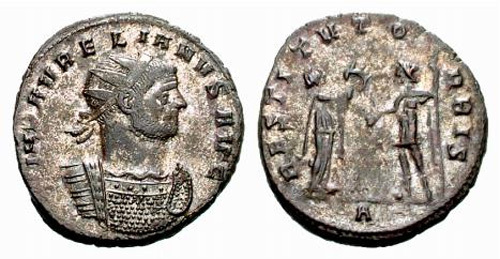 Reverse: ADVENTVS AVG, Aurelian on horseback riding right, holding scepter and trampling over enemies below; Q. 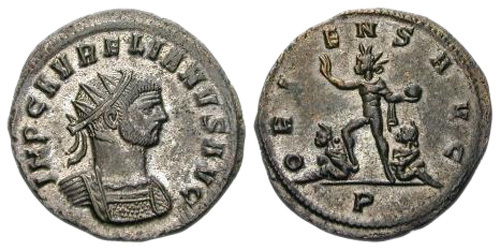 Reverse: ADVENTVS AVG, Aurelian on horseback, galloping right, brandishing spear, and riding over two enemies. No mintmark. Reverse: IOVI CONSER, Aurelian standing right, holding short sceptre, receiving globe from Jupiter standing left, B in exergue. 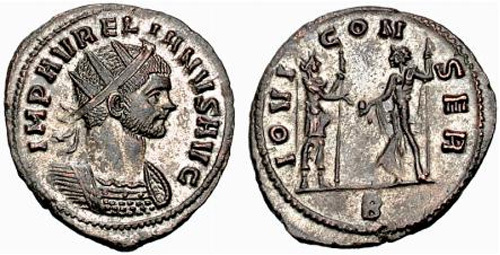 Reverse: IOVI CONSER, Aurelian standing right, holding short sceptre, receiving globe from Jupiter standing left, P in exergue. Reverse: IOVI VICTORI, Jupiter standing left, holding Victory and sceptre; at foot, eagle. 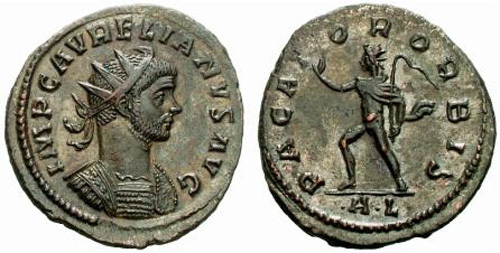 Reverse: RESTITVT ORBIS, Emperor standing left, holding spear, receiving wreath from woman; A in exergue. 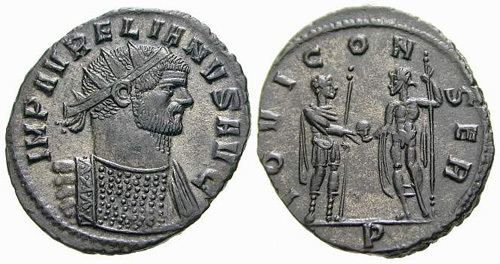 Reverse: VIRT MILITVM, Emperor standing right, holding globe and sceptre, facing soldier holding Victory; T in exergue. 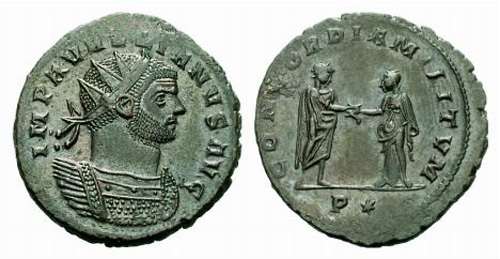 Reverse: CONCORDIA MILITVM, Emperor standing right, clasping hand of Concordia standing left; P star in exergue. Obverse: IMP C AVRELIANVS AVG, Radiate and cuirassed bust right. Reverse: ORIENS AVG, Sol walking left, right hand raised, left holding globe, treading down one of two captives; T in exergue. Reverse: ORIENS AVG, Sol walking left, right hand raised, left holding globe, treading down one of two captives; P in exergue. Reverse: ORIENS AVG, Sol walking left, right hand raised, left holding globe, treading down one of two captives; S in exergue.